India clinched its first ever individual Olympic gold medal in 108 years when Abhinav Bindra won the 10 meter air rifle event in one of the most pulsating shooting finals in the history of the world’s biggest sporting extravaganza. The historic victory for the 25-year-old pro from Chandigarh came against heavy odds as he entered the event ranked number 17 in the world and pitted against Athens Olympic champion Zhu Qinan of China and Henri Hakkinen of Finland rated much higher than him. But Bindra proved that reputation and history counted little as he overcame a two-point deficit against Zhu and Haikkinen after the qualifying round and annexed the title. Bindra emerged triumphant in the 10-shot final with a finish of 104.5, taking his tally of points to 700.5 as against Zhu’s silver winning performance of 699.7 (597+102.7) and 699.4 (598+101.4) by Hakkinen, which gave the Finn Army marksman the bronze. His first shot of the final a 10.7 saw him move to the third place and by the time he was preparing to shoot his fourth, the Indian had risen to the second spot. A 10.6 on his seventh attempt earned Bindra the lead and in the deciding shot he got 10.8, way ahead of 10.5 by the Chinese and 9.7 by the Finn to bring India the first ever gold medal by an individual since the country first participated in Olympics in 1900. The businessman from Chandigarh also ended India’s wait for a gold since the hockey team fetched a yellow metal in the Moscow Olympics in 1980. “It can’t better than this. Can it?” an elated but composed Bindra said soon after achieving the feat. “I sincerely hope my medal changes the face of India’s Olympic sports,” the bespectacled shooter told reporters. As Bindra bowed his head to receive the gold medal from the Princess of Lichtenstein, a small country in central Europe, and the Indian national anthem was played out for the first time in this edition of Olympics, the shooter had his feet firmly on the ground, betraying little emotions. “For me, life will go on as usual but I sincerely hope Olympic sports get a leg-up. It’s not a priority back home and I hope more focus is paid to these events like shooting,” he said. Asked about his scorching run in the finals, Abhinav said it was a conscious plan to pull out all stops and it paid off. “I entered the final as fourth, which means I had to go all out for it. That’s why I was so aggressive and it paid off in the end. I guess it was my day,” he said. Bindra, whose career at one stage was jeopardised by a nagging back injury, said it was not easy to keep himself keyed up all along. “I worked hard, left home and trained in Germany. It only proves that if you keep working hard, you would have your day someday and fortunately, it was my day today. “My parents, family and coaches stood by me all along and I owe it to them,” he said. Even in his hour of supreme glory, Bindra was magnanimous towards his rival when he applauded Zhu for his performance and said “he should be happy that he won a medal”. Bindra’s compatriot Gagan Narang too almost made it to the final but was ruled out on countback. Gagan scored 595, levelled at the fifth place but lost out on a final place in countback. Drip by drip, Sri Lanka made their way to a comprehensive series win, their first over India since 2001. On what turned out to be the final day of the series, Sri Lanka did not attack overtly, and kept their composure at crucial junctures – when Rahul Dravid and VVS Laxman had a long partnership, and also when India struck with two early wickets, after Sri Lanka came out in pursuit of 122. A bowler short, a batsman limping, the No. 11 in no shape to bat, and only 14 runs ahead with half the team gone, India started the day as no-hopers, but they managed to give Sri Lanka a few nervous moments. Dravid and Laxman – who was nursing an ankle injury – provided resistance for about 90 minutes. Harbhajan Singh played a cameo to take the lead beyond 100, and then took a wicket in his first over. Sri Lanka seemed in no hurry. They waited patiently, bowled in the right areas, and got the last five Indian wickets without much damage. It was Ajantha Mendis who broke the resistance, dismissing Dravid half an hour before lunch. And when Harbhajan, who hit five boundaries in his 26, looked to take India towards a sizeable lead, Chaminda Vaas, that epitome of discipline, struck in the first over he bowled after his three with the first new-ball. When India struck early, reducing them to 22 for 2, Sri Lanka didn’t look to hit out, and waited instead for Zaheer Khan and Harbhajan to tire. Harbhajan, who opened the bowling in Ishant Sharma’s absence, bowled Michael Vandort with an arm-ball; and Zaheer Khan got Kumar Sangakkara soon after on the check-drive. Malinda Warnapura and Mahela Jayawardene weathered the storm, survived lbw shouts, and were content to add only 23 in 10.3 overs before tea. The two went on to frustrate the Indian bowlers after tea, too. They never looked harried, kept rotating the strike, and by the time the Indians had frustrated themselves into exhausting their reviews, started to have some fun with sweeps – both orthodox and reverse. The only contest in the end was whether Jayawardene would get to a half-century as Warnapura had done earlier. Jayawardene was 46 and Sri Lanka three short of the win when he square-cut Sourav Ganguly for a four to end the match. That India had a semblance of a chance when they began bowling was thanks to the partnership between Laxman and Dravid. Coming out of bad patches, they took the first steps towards what briefly seemed to be an incredible comeback, before they were stopped. Nonetheless it was the best partnership between two of the Fab Four in this series. The two looked comfortable reading the spinners, nudging and flicking for singles at ease, and capitalising on the fields set by rotating the strike. Laxman, who had Gautam Gambhir running for him, was visibly in pain, limping away to square leg when he got singles. Dravid and Laxman lasted as long as they did thanks in no small measure to Sri Lanka’s strategy: for much of the time, they didn’t employ conspicuously attacking fields, and gave away singles for free as they tried to prevent boundaries. As a result, despite the time consumed, India’s lead never reached threatening proportions. The day started with Dravid closing in on his first half-century of the series, which he brought up with a punched boundary off Mendis. He then settled down again, looking determined as he played the most confident innings by an Indian middle-order batsman in the series. Laxman at the other end received plenty of favours from Sri Lanka. When he was on 35, he edged Muttiah Muralitharan, but there was no slip. The field at that time had no slip and no silly point, and had a short mid-on, a short midwicket, a short square leg, and a backward square leg. In Murali’s next over, Laxman was dropped by Thilan Samaraweera at short mid-on. After he got to his second half-century of the series, he was dropped by Malinda Warnapura at forward short leg. In between those drops and missed chances, he hit Dammika Prasad for two delightful boundaries, but those were about the only quick runs India got from Sri Lanka, who stuck to their plan of not letting India run away with the game, testing their patience and resolve, knowing the wicket-taking delivery would come. Come it did, courtesy Mendis, who, bowling from round the stumps, drew Dravid forward and got the ball to move enough to take the edge. Then Murali, who had started from over the stumps, came back round, and got Kumble lbw with an accurate offbreak. Mendis ended with 26 wickets, the best for a debutant in a three-match series, and Murali with 21. Sri Lanka have now won 13 of their last 16 series at home, and have not lost to India at home since 1993. The way Mendis and Murali bowled through the series bodes well for the continuation of Sri Lanka’s near-invincibility at home. It could signal the beginning of the end for the most feared middle order in world cricket. He dazzled the world with his amazing talent, he gave cricket another name, he made cricket popular with his personal looks and talent, he is and always will be remembered by cricket fans worldwide. Imran khan, an unbelievably talented all rounder who’s name has been mentioned several times in Guinness World Record as one of the best all rounders (person who can bat as well as ball) in the history of cricket and has reached the top like no one else. He was born in Lahore, Pakistan into a family of six. He entered the world on November 25,1952, the only boy and seventh member of his family. Hisparents gave him the name Imran Khan Niazi and truly loved him since he is the only boy in their family. Imran was part of a well-educated family. His parents believed that their children should get the best of education, and become something. Imran’s parents have believed this and followed through with it, and that is why Imran’s sisters are so successful today. His older sister Robina is an alumnus of the LSE and has a senior position in the United Nations in New York; his other sister Aleema has a master’s degree in business administration and runs a successful business; Uzma is a highly qualified surgeon is working in a Lahore hospital; while his other sister Rani is a University graduate who coordinates charity work. When it was time for Imran to go attend a college, he went to the prestigious public school in Lahore, the Aitchison College. There he was by far the best player on his team, being a very fine batsmen. He was still though quite far from becoming the best in the world. As Imran grew older, his interests went from being a batsmen to being a fast bowler. When sixteen, Imran made his debut for Lahore. Imran’s cousins Javed Burki, and Majid Khan were a great part of cricket therefore when he made his test debut people thought that he made it because his family was on the Pakistan’s Cricket Team. (Nepotism)Later, Imran had to put cricket to the side and focus more on his studies. Undoubtedly he was back again at the age of eighteen. He played admirably which resulted in him moving to England as he was chosen to play for a private school there.As the year 1971 approached, he made his test debut while visiting England.During this tour, he was fined many times by the management because he was looked upon by his peers as being a very snobby and wild player. Also on this tour, Imran did not play as well. Because of his “not so good” bowling, Pakistan was coasted to settle for a draw. This was the only test match on the tour. 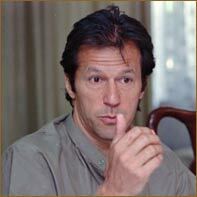 When Imran was twenty-one, he was admitted in the Oxford University. For three years he studied economics and politics. In 1974 Pakistan toured England and therefore he was selected because of his form for Oxford University and his experience with speaking English. He had not succeeded to make a big mark because all three of his tests were drawn. In 1976 Imran returned to Pakistan after being away for four years. 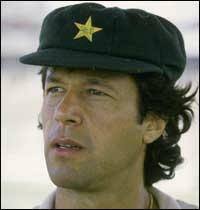 During the 1976-77 season, Imran got a place in the Pakistan cricket team. He had impressed the team with his fantastic bowling. Later he moved to play with Sussex. The biggest reason for Imran to do this was because of his love affairs with the nightlife of London. He was quite angry at Worcester (a team he played for before he played for Sussex), because of the racism he found there. During the time he had been playing for other teams, Imran had become quite a big star.Everyone was able to see that this guy had talent and played very well. At this point, not only was he playing well, but had basically become a superstar. Imran continued to play for Sussex, because he enjoyed it there. At this point he had become the “father” of the reverse swing. His most famous partner was Sarfaraz Nawaz, in which the partners could make a lot of runs. Soon after, under the orders of the top official, Imran came back to Pakistan to play test cricket for the series against India. During this match, Imran hit two sixes and a four with only seven balls remaining. Because of Imran’s huge success, one could easily say that Imran was one of the most adored cricketer through the land at this point. During the early 80’s Imran was not only at his cricketing peak, but had quite a few relations with women. He had a relationship with Susannah Costantine, ex-model Marie Helving, and artist Emma Sargeant. Some of his relations ended simply because of difference in culture and because of the busy and traveling life of Imran. He brought some of his relationships back home to Pakistan in which he was frowned upon because he was an individual of Muslim faith. When Imran was thirty, he became the captain of the Pakistan cricket team. He lead them to a victory against England in their second test match. in a one day match. In 1987, Imran decided to retire from cricket. Javed Miandad took his place. Because Pakistan’s best captain was gone; the team was in somewhat of crisis .President of Pakistan Zia ul Haq asked him Personally to come back, therefore he was back as a captain in 1988. In later interviews he mentioned that personally his passion for the game was no more in 1987, he was already recognized around the globe. 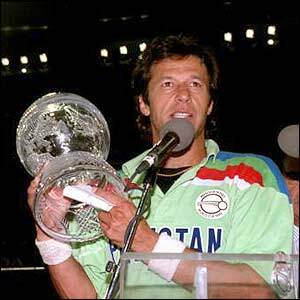 1992 was the year of the World Cup Cricket competition, the most prestigious cricket event, Pakistan’s start was not good and lost couple of games and was looking to be kicked out in early stages he later told that during that time the manager of cricket team came to him and asked him that should I buy the tickets to go back home imran replied angrily that don’t come to me again and remember you are not out until you are really out. The Tiger was absolutely correct ,he gathered his team gave them a lecture inspired the spirits of the young team with his charisma, and the team replied with going into final. 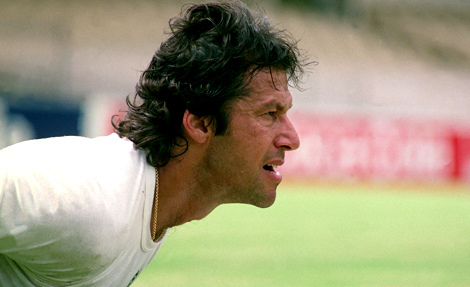 In the final at the age of 39, Imran showed no signs of his age scoring highest runs for his team. And then with his prolific captaincy he smacked the opponents, took the last wicket for his team and made history by winning the First and sole World Cup for his motherland. He ended his career with an outstanding score of 3807 runs and 362 wickets in only test matches. During his career, Imran had turned the Pakistan cricket stars into the stars they are today. The day that Imran retired was a very big day. So big that the President of that time, Zia personally tried to stop him from retiring. Imran said that he wanted to retire at the highest point of his popularity so that people would be able to remember him forever.4 He wanted his name to be in all hearts and be recognized for all his accomplishments. Imran had officially ended his career as a cricketer and is truly remembered by all. When Imran won the world cup, he had raised twenty five million dollars to build a cancer hospital in memory of his mother. About ten years ago when Imran’s mother had cancer; Imran was desperately looking for some place to take her, but none of the hospital’s in Pakistan had the right facilities to treat her. When Imran took her to an outside country, it was too late; she had lost her battle against cancer. Eversince then, Imran has wanted to build a cancer hospital. Today he has a internationally recognized hospital standing in Lahore, Pakistan. It is named after his mother Shawkat Khanam. It is the only hospital of Pakistan that does not charge anything to patients who cannot afford the treatment and most of its patients are children. It is completely dependent on donations and needs at least 400 Million Pak Rupees to run. Although it is difficult to raise but he is carrying on some how. In 1995, Imran decided to settle down and marry. He married Jemima Goldsmith who is the daughter of a billionaire. She was Jewish and converted to Islam by choice just before the two got married. Their wedding took place in Paris. When they came back to London, they threw a party which was more for the public. On November 18th 1996, Imran and Jemima were the proud parent’s of a baby boy. The named him Suleiman Isa. On April 10th, 1999 Jemima gave birth to yet another baby boy. They have named him Kassim. Today, Imran has entered the world of politics and has set up his own party Tehreek-a-Insaf (Campaign for Justice). The party is struggling and in the two elections it participated in, it could get none seat in the first and won a single seat in the next election that seat was of Imran himself. So he himself has become Member National Assembly He continues to fundraise for his hospital. He does this by taking tours with popular stars. Some stars donate their money to Imran’s hospital. Imran was a born leader and his captaincy led his beloved Pakistan to victory in the 1992 World Cup finals where they took on and beat a pretty good England side. Imran was a great all rounder, with his in swinging fast bowling and measured attacking batting displays he dragged his talented side to a great success down under in a magical World Cup final in Australia and New Zealand. His greatest success was that night in Melbourne with a 22 run victory of England. “He is talented, very talented, but has no brains,” was Geoff Boycott’s on-air verdict after Virender Sehwag’s attempt to hook a ball from outside off stump found the fielder at deep square leg and triggered a first-innings collapse at the SSC. After two batting collapses in the first Test it was imperative that India got a solid start. Sehwag provided that by using a simple mantra: if the ball is there to be hit, hit it. Circumstances rarely affect Sehwag and he put the pedal to the metal. A whip off the pads past midwicket got him started, a wild sweep that was unsuccessfully referred didn’t stall him, and when he charged Ajantha Mendis and swung him over cow corner for six, Sehwag was at full throttle. The stand-out feature was the effortless manner in which Sehwag handled Mendis, who was virtually unplayable in Colombo. The key, in his own simple words, was that here Sehwag “picked him [Mendis] off the track, from where the ball pitched”, something only he and and Sachin Tendulkar have managed to do in this series. When Mendis tossed the ball up on middle and off, Sehwag smothered the spin, and when the bowler drifted on to middle, he went back and turned it fine. If it spun in sharply, Sehwag adjusted his back leg and brought his bat down quickly to kill the ball. Sehwag also picked the two-fingered googly and moved back to cut or punch through the off-side. He failed to beat cover with the drive once but replayed the shot two balls later with more power and placed it to perfection. Mendis’ first four overs cost 29. Sehwag accelerated and yet remained in control with Gautam Gambhir, fleet-footed against spin, in the passenger seat. There were cracks at one end of the pitch and Nuwan Kulasekera asked a few questions but Sehwag steered clear of them. He cut Muttiah Muralitharan’s first ball, a doosra from around the stumps, to reach his half-century off 50 balls. His strike rate, like a speedometer, fluctuated from 60 to 98 and beyond. India’s 100 came from 115 balls and Sehwag’s contribution was 59. Like Sri Lanka did at the SSC, he and Gambhir ran hard, hustling for the second, and constantly looking for scoring opportunities. Sehwag and Aakash Chopra, another Delhi team-mate, did this effectively during the majority of their 19 partnerships, notably in Australia in 2003-04. Some of today’s singles were risky but the intent was obvious and it frustrated Sri Lanka. In the over before lunch, Sehwag put his arm around Gambhir’s shoulder and had a word. Gambhir reached his fifty off the next ball and a beaming Sehwag rushed to congratulate him. When Sehwag dabbed a single behind point to raise the 150 partnership, he punched gloves with Gambhir as they crossed. How many batsmen can power a side to 150 for 0 at lunch? The camaraderie was plain to see. After a four-hour rain delay, Mendis tested Gambhir with his variation but at the other end Sehwag disdainfully smashed Vaas over cow corner off his second ball after the resumption. Two balls later he played a booming straight drive to reach his century, which he celebrated with a proud wave of the bat to the dressing room and an embrace from his partner. His 15th hundred took only 87 balls with 15 fours and two sixes but the message was deeper. At the MCG, in 2003-04, India were 311 for 3 but collapsed for 366 after Sehwag was dismissed for 195 at the end of the first day. In Adelaide earlier this year Sehwag scored 151 out of India’s 269 in the second innings. Today, Sehwag had driven India to a position of strength at 167 for 0 before four wickets fell in 20 balls for 11 runs. As he had done against England in Galle during the winter, Chaminda Vaas, rejuvenated after the rain delay, struck twice in an over. Tendulkar and Sourav Ganguly were dismissed with the score on 178 and the morning’s work had come undone. “I didn’t notice any change in my batting after the four-hour break in play,” Sehwag said. “Every batsman has his own mindset with which he plays, but I just played my shots.” Even as stumps approached, Sehwag relied on his base instinct. Mendis went around the stumps and Sehwag used his feet to smash him down the ground and hit two consecutive fours through cover. Crushed in Colombo, India arrived in Galle needing to find a way to bounce back. Only a vivid imagination could have conceived of a fightback without it being led by Sehwag. Like the white breakers of the Indian Ocean, lashing across the rocks in the background of the Galle International Stadium, Sehwag has injected life into a one-sided series. He has brains alright, and he’s used them rather well. “I am sure that the BCCI are in fact aware and would be extremely supportive of the good causes that Lashings support some of which affect Indian charitable causes as well as getting the word of cricket spread”, he added. “Lashings World XI works closely with the ECB on all matters and they were informed that Sachin Tendulkar was indeed playing for Lashings. The BCCI I am sure would be above making comments and issues out of a game against school children for charitable causes. “If the BCCI had an issue with it I am sure they could have contacted either Lashings or the ECB and would have addressed the matter. It makes no sense to discuss this after these matches have been played,” Folb pointed out. Pakistan’s chances of hosting the Champions Trophy in September have been pegged at “50-50” by an official who attended the ICC’s security briefing in Dubai on Sunday. The meeting was attended by board officials of the eight participating countries, broadcast executives, and players’ association representatives. The ICC board will now take a final decision over the next 72 hours after its members discuss the issue over the phone, the official said. The ICC board, while taking a final decision, will also consider a report on Sunday’s security briefing. Reports in British newspapers suggest that the ECB has already told its players that it cannot guarantee their safety in the light of recent bombings in Karachi and Islamabad. Asked whether Sunday’s meeting discussed alternate venues for the tournament, the official said, “That topic was not touched upon at all in this meeting. That is for the ICC board to discuss.” South Africa has been projected as the possible alternate host, in case the ICC board decides against Pakistan, after Sri Lanka, the original stand-by venue, was found to have significant security concerns of its own. The ICC said in an official statement that “until or unless the board decides otherwise, the tournament will proceed in Pakistan.” Haroon Lorgat, the ICC chief executive, later told reporters that Sri Lanka remains the alternate venue. One compromise being touted is to move matches away from Karachi, considered the most risky destination, to Lahore and Rawalpindi.